Sponsored by Livy O's Catering Co.
On Tuesday, March 26, 2019 the Greater Riverview Chamber of Commerce (GRCC) hosted their monthly luncheon event at The Regent, 6437 Watson Road, Riverview, FL. This month was a special treat as the Sponsor was also the delicious Caterer Livy O's Catering Co. Pastor Don Rhone, The Bridge of the Bay Community Church, provided the day’s invocation. 2019 GRCC President Michelle Mosher, Southshore Insurance Professionals, LLC, welcomed everyone to the luncheon and invited her Board of Directors and Past Presidents to introduce themselves to the crowd. Leading the group this month in reciting the Pledge of Allegiance was 2019 Honorary Mayor of Riverview Bill Andrew, Aldea Green - Eagle Senior Living. Joe Eletto, Century 21 Beggins, presented this month’s Military Recognition and Appreciation with a moving tribute on Vietnam Veterans and recognizing distinguished GRCC member Richard Rohde, R Processor, Inc. before presenting him with a Certificate of Appreciation and a “Welcome Home, Vietnam Vet!” Michelle followed by recognizing Lynn Gray, School Board Member – District 7 (County Wide) and Mark Proctor, Hillsborough Soil and Water Conservation District who were in attendance. Sponsor and caterer for the March Membership Luncheon Meeting Omar and Lennise Germany, Livy O's Catering Co. thanked the room for the support they have received since the opening of Livy O's Catering Co. They also spoke on the teaching of meal preparation and their desire for healthy eating habits of their family. They were happy to spotlight Bernadette & Chris Pello, Livingstone Academy, who were the speakers for the luncheon. Bernadette explained that Livingstone Academy schools are private schools for students with learning disabilities and the county's largest provider for students with the McKay Scholarship. They have a dedicated team of educators who understand the unique learning styles of each student and makes the accommodations to meet their needs. Jon-Paul Lavandeira of Hillsborough County Code Enforcement, provided an overview of the program and let the group know they accept volunteers and very much appreciate the help of those volunteers. Also, at the podium was Golf Tournament Chair Christian Beiter, Preservation 1st Financial Group, LLC, who provided a recap of the very successful 2019 GRCC Golf Tournament and to thank the many sponsors, committee members and volunteers who made it happen. A 2019 First Place Team plaque was presented to Leroy Daley, All Season Electric Corp.
Marijean Reith, TEAM REITH - RE/MAX Realty Unlimited, came to the podium to announce the February Ambassador of the Month. This month’s award went to Diana Carbone, Young Living Essential Oils. 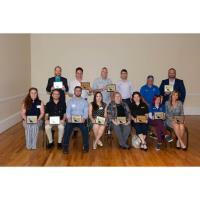 During the luncheon, Kendra Wilson, Suncoast Credit Union - Riverview Service Center, welcomed 13 New GRCC Members who were presented a 2019 Greater Riverview Chamber of Commerce membership plaque to proudly display. Bill Andrew, Aldea Green – Eagle Senior Living and Faith Hanaway, The Alley At SouthShore provided recognition to renewing members. All American Title Insurance, Inc. The Barn at Winthrop, Inc.
Attendees were encouraged to attend the next GRCC Membership Meeting Luncheon scheduled for Tuesday, April 23, 2019. This April luncheon will be sponsored by River Oaks Treatment Center. Anas Benyamine, Computer Networld, Inc.